The city’s long been excited about the western extension of the Island Line. Ever since the new stations opened last year, numerous articles have been written about Sai Ying Pun and Kennedy Town and about where to shop and what to eat. Oddly, the Hong Kong University (HKU) stop hasn’t been garnering half the buzz that its neighbouring stations have been enjoying. The obvious explanation for this oversight is that most of the exits open up in to the university, which only excites students keen on a speedy path to get to class. But a lesser-known reason might lie in the past. HKU Station is right next to Shek Tong Tsui, once Hong Kong’s red light district in the early 1900s. This area was renamed Kuramae during the Japanese occupation, when the area boomed with brothels and restaurants that only catered to the Japanese. As with all things connected to the occupation period, sordid tales of inhumanity lingered after World War II, and a somewhat eerie shadow fell over Shek Tong Tsui because of its amourous past. Time, however, is the best remedy for misconceptions, and – together with the power of gentrification and an MTR station smack bang in the middle the neighbourhood – can really work wonders. With new MTR exits of course come new apartment blocks. Eight South Lane is a swank development that houses both luxury digs and Cobo House by 2:amdessertbar. There’s a backstory here: the concept is a collaboration with Janice Wong, founder of Singapore’s original 2am:dessertbar and twice named Asia’s Best Pastry Chef by S Pellegrino. Cobo House represents not just Wong’s first Hong Kong dining room, but also her first fully-fledged venture into the realm of savoury dishes through her concept of edible art. The interiors at Cobo House sure are elegant. Glass windows extend from the floor to the 13-foot ceiling, and although overlooking older apartments and construction sites, there is enough greenery on the sidewalk to set a relaxing vibe. Slate grey tones and marble counters serve as a blank canvas for what’s to come on the plates, because these really are works of art. The chef’s tasting menu of three ($428) and four-courses ($588) is really quite a fair price compared to the average for similar meals around town and we decide to go all out with the four course menu. Starting with a smoked tuna tartare, a mustard yuzu and purple cauliflower adds an Asian twist and piques our interest with its texture. What we love is the copious amounts of aesthetically pleasing tapioca cracker – more often than not there aren’t enough carbs on the side to serve as a serious vehicle for the tartare, but we don’t have this problem here and we polish off this satisfying starter with relish. 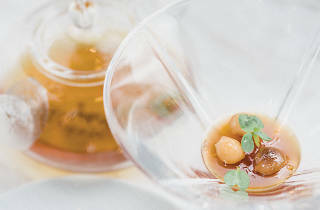 Next to arrive is the chicken consommé, in which a concentrated chicken broth is poured out of a glass teapot over a masala tea jelly in a martini glass-shaped bowl. We dig our spoon deep into the bowl to get tea in our soup before it dissipates and while the first spoonful offers an exotic fragrance of spices in a savoury soup, the rest of the experience is dulled by the dispersion of the jelly into the liquid. After this tiny setback, things pick right back up with the mains. Simply called Earth, the wagyu beef is seared so that a thin crispy crust captures all the juiciness of the beef. We’ve never experienced such precision in execution. The sides of shoyu marinated potatoes with a sweet alcoholic tang also prove extremely moreish, and a perfect counter to the protein. The portions are lightweight so far, but we’re satisfied and we brace ourselves for dessert. The Popcorn Sweet and Salty is beautifully presented and conjures up images of Australian Aboriginal art. To further enhance the olfactory senses, freshly popped kernels are placed inside a custom ceramic cylinder for fragrance. This may be superfluous because the dessert on the plate is more than enough to excite us. A sweet popcorn mousse swirls through the plate, dotted with a salty custard which delights with every bite. 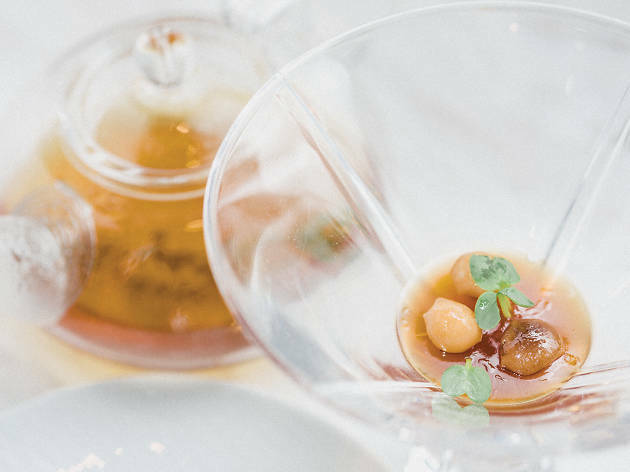 In combination with a tart passionfruit sorbet, our palates are refreshed before every spoon and we find that chef Wong’s title is rightly deserved.